Summit Village consists of several different housing towers. The main office is located in Monarch House. 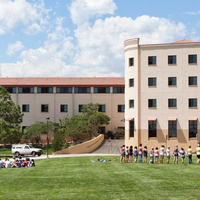 See building "MON" on the campus map at www.uccs.edu/map. Adam really did a great job informing me of the first steps in studying abroad. I know without that meeting, I would have been lost! This was a valuable workshop for students at UCCS. Although I'm not an international student, I learned about some great resources available at the Recreation/Wellness center. The presentation was good, and helped me learn a little more about United States Health Care system.